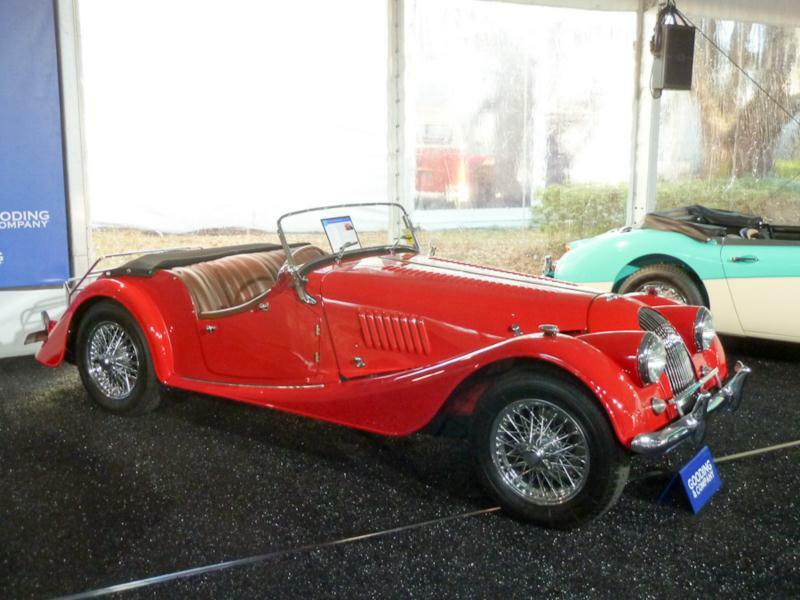 The two-seat Morgan 4/4 was re-introduced after a four-year absence in 1955 as a low cost sports car. The Series II, as it was known, was fairly basic, with a 1,172-cc, 100E Ford side-valve engine and a three speed gearbox with a remote shifter under the dash. It looked and drove like a Morgan, with a sloping grille, basic weather protection, and a stiff ride. The 36-hp engine delivered 0-60 times of 26.9 seconds, and the car’s top speed was about 75 mph. MSRP was $1,995. The front suspension remained Morgan’s sliding pillar system that dated back to 1910, but the 4/4 had rack-and-pinion steering. Performance was improved in the Series II Competition model of 1957, which boasted an Aquaplane aluminum head and twin SU carburetors, but the Series III of 1960 was the most capable performer yet, with the new “notchback” Ford Anglia’s 997-cc over-square OHV four-cylinder engine. It only rated 54 bhp, but revved willingly to 5,000 rpm, making full use of its new four-speed gearbox. The Series IV of 1961 received the Consul Classic’s 1,340-cc OHV engine and front disc brakes. The 0-60 time dropped to a respectable 10.5 seconds, with a top speed of 92 mph. By the time the Series V arrived in 1963, it carried the Cortina’s 1,498-cc motor with 65 horsepower and an optional $270 competition package, which bumped output to 83 bhp. Buyers who availed themselves received a Weber carburetor, higher compression engine and close-ratio gearbox. Probably due to the gearbox ratios, 0-60 actually rose to 11.9 seconds, but the top speed climbed to 100 mph. Wire wheels were offered as an extra-cost option. Series V production ceased in 1968, and the model was replaced by the 4/4 1600, which used the Ford cross-flow Kent engine and would be built until 1982. Production totals were modest, as befits a hand-built car: there were 387 Series II, 59 Series III, 206 Series IV, and 646 Series V cars built. A whopping (by Morgan standards) 3,480 4/4 1600s would be sold between 1968 and 1982. Morgans remain elemental 1930s fun – even if they’re not fast, they feel it. However, the wood frames tend to work loose with age and a car that spends much time in the weather needs new wood every seven years or so. Start by checking the doors for sagging and flexing and be sure and have your prospective purchase inspected on a lift.